How will the Recent OPEC Meeting Affect Oil Prices? Although OPEC's oil-producing member countries agreed to extend their oil production cuts to the end of 2018 at last week's OPEC meeting, there remains a chance that the production cuts could end earlier. The members agreed to a June review process to assess price and inventory levels, compliance by member states to agreed limits as well as other market conditions. Citi analysts believe that if oil prices are high and markets are tight, there is increased likelihood that normal production levels will resume. However, Citi also believes that lower prices could increase the likelihood of both OPEC and non-OPEC producers suggesting that the deal carry on through 2018 at the June review – which should be supportive of oil prices. Meanwhile, the battle between shale and OPEC continues as US Energy Information Administration (EIA) data indicate that US crude production was some 290k barrels per day higher month-over-month in September than data originally indicated. 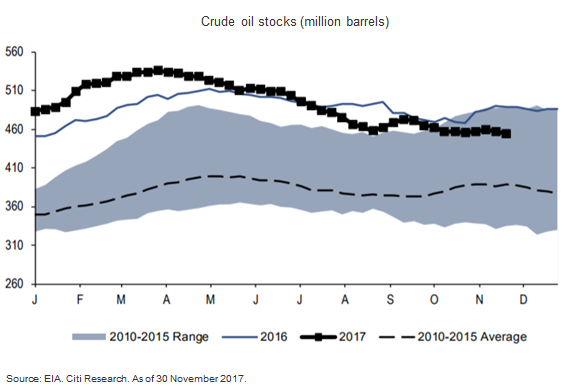 Citi's own projection of US production growth year-over-year in 2018 is in a range of 1m barrels per day, with 800k barrels per day coming from shale. Citi expects global economic growth levels to be positive for oil product demand and oil balances. On the contrary, the impact of limited supply is prompting enough new supply to neutralize the demand effects. Hence, Citi's 2018 annual oil price expectation remains unchanged at $54 per barrel. The West Texas Intermediate (WTI) crude oil price is currently at $58.22.